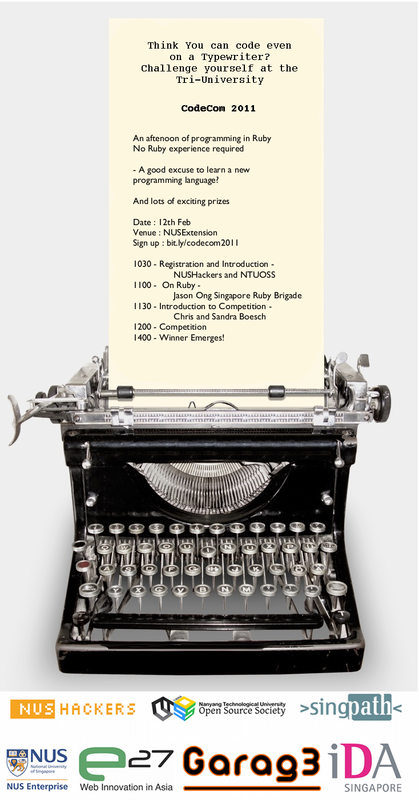 We’re holding a Tri-University Coding competition this Saturday (12th Feb) at the NUS Extension. It’ll be an afternoon of programming in Ruby with our peers from NTU and SMU - but with the guarantee that you don’t have to know Ruby to take part (yes, it’s that easy). Here’s the sign up link. 10:30am Registration and Introduction by NUSHackers & NTUOSS 11:00am On Ruby - by Jason Ong from the Singapore Ruby Brigade 11:30am Introduction to the Competition Platform (Singpath) by Chris and Sandra Boesch 12:00pm Competition Commences 2:00pm-3:00pm Winner Emerges! Prizes: a 1TB hard disc drive, a 19’ LCD screen, and 5 other consolation prizes. SingPath will be the Competition Platform. It’s developed by SMU Professor Chris Boesch. You can test drive it before the competition! We’re rather excited to be working with the people at NTUOSS and SMU on this competition, and we hope to have everyone bring something back from it. See you there! Psst: a suggestion from one of our members: think of this as an excuse to learn a programming language - in a single afternoon! 1) Please get your laptops. And make sure they are fully charged. We have power extensions, but we are not sure if we will be able to supply power for all of you. 3) We have Internet access there. Again, the access point might not be able to take load of all the people present there. So if you have 3G Dongles, please get those. 4) The registration starts at 10.30am. You can get your friends along, even if they have not registered. Just drop us an email anytime before tomorrow. 6) And join this group if you are interested in our future events as well - groups.google.com/group/nushackers Its kind of our discussion place. Hope to see you tomorrow! And lets see who wins this tournament! It can be YOU!